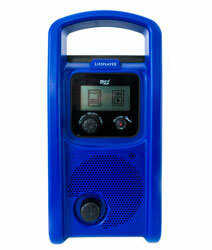 The Lifeplayer is the first media player, multi-band radio and recorder designed and engineered for group and educational use. This innovative tool combines these technologies in ways never before possible to deliver on-demand audio content even to the most remote places. Using a microSD card, dozens of hours of MP3 audio content can be pre-loaded at our factory or loaded locally. Content can be repeated and paused as desired. This means that children will never have to miss a class as they can make it up. Farmer listening groups can gather when convenient for them and record important radio programmes as well if desired. The limitation of radio is that if you miss a broadcast, it’s lost forever. With the Lifeplayer, radio programmes, messages, announcements, weather reports, news, etc., can be recorded for all to hear. The Lifeplayer is powered by a solar panel and has a winding mechanism as a back-up power source. The solar panel charges via a power cable or can be permanently affixed to the unit if desired. A12V wall charger is an available option. And it’s loud. With its excellent speaker quality 40 or more listeners can hear it. End-users were involved in a consultative design process. The Lifeplayers’ features are based on what people said would be important to them. FM, AM and three short-wave radio bands. Up to 64GB of pre-loaded educational or informational content on miscroSD cards in any subject or language. Unlimited amounts of content can be updated locally via additional microSD cards. LCD screen to make navigation easy. Programming that can be factory or locally loaded as needed on microSD cards. Radio or live voice recordings for playback later. On-board monitoring and evaluation software to determine how the device is being used (optional). Battery and electricity independent capability, using solar or wind-up technology to charge it. Ability to be charged via mains electricity or a car battery. A retractable antenna and a SW booster cable. The Lifeplayer comes in two models, the Plus and the Start. The Plus has both an internal and an external microSD card slot, whereas the Start has an internal one only. Units can be customised to the needs of a project or an NGO. We launched our Lifeplayer MP3 a year ago. This first of its kind media player for development is already in the field and providing educational access to tens of thousands of listeners. In the coming year, our Lifeplayer MP3 will be featured in many education programmes across sub-Saharan Africa. To remind our friends of just how innovative this tool is, we’ve made a short video. Have a look! Tell us what you think!